where t is the interest rate. This is called discounting, which is the calculation of the present value of a future cash flow. And so on for 3 years, 4 years, ... n years. This is called compound interest, or interest capitalisation. Indeed, after one year, the amount M initially invested generated an amount of interest equal to (M x t), which is reinvested to generate interest again. The interest rate market is an extraordinarily diverse, deep and complex market. It is indeed on this market that short-, medium- and long-term financing comes in the form of debt (unlike the equity market, which is the capital market), serving governments, local authorities, companies and even individuals via real estate or consumer loans. The determining factors of the rates practiced on the market are therefore multiple and it is not the purpose of this article to review them, since it is primarily a macroeconomic subject. The creditworthiness of the issuer: the higher the risk of default, the higher the rate charged. This ability of the issuer to fulfill its commitments is measured by rating agencies. The highest rating is generally given to States. This gives them the opportunity to finance themselves at the lowest rate, known as the "risk-free rate" (a commodity that is becoming increasingly rare at the moment!). Other issuers will have to pay a "risk premium" or "spread", a rate that is all the higher the lower their rating. The rates of securities already issued on the market for maturities and issuers of comparable quality: this is where the notion of comparability between several possible investments comes into play, as well as the influence of changes in market rates on the valuation of instruments held in the portfolio, i.e. the issue that interests us: interest rate risk. From the market rates for the most widely used instruments, such as bonds and interest rate swaps, it is possible to construct yield curves. 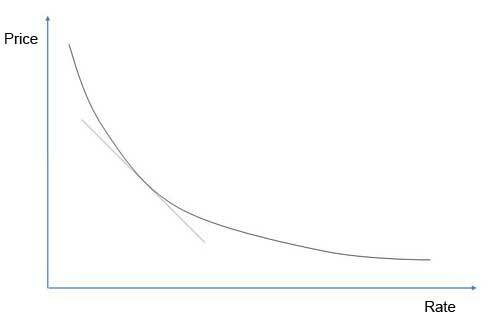 These curves represent, in graphical form, a coherent set of interest rates classified by increasing maturity. They will serve as a benchmark for valuing financial instruments and assessing interest rate risk. What is worth today, and therefore what amount does the investor agree to pay, to acquire an instrument, for example a bond, which will pay a coupon C1 in one year, C2 in two years, etc., as well as a redemption amount M at maturity? If market rates increase, the price on the secondary market for bonds already issued decreases. If market rates decrease, the price on the secondary market for bonds already issued increases. This relationship can be intuitively explained by the fact that, if rates increase, new issues will pay a better rate than bonds already issued, making the latter less attractive to investors. Their price will therefore decrease under the effect of the law of supply and demand. Conversely, if rates fall, old bonds are more attractive than new ones and their price increases. If we prefer to stick to the cold objectivity of mathematics, we can observe that the market value of bonds is calculated by a discount formula, seen above, where the rate appears in the denominator. There is therefore an inverse relationship between the rate and the discounted value of future cash flows. Therefore, if market rates increase, the value of the bonds that the investor holds in the portfolio decreases. If he sells them, he generates a capital loss. However, these bonds pay him coupons, which he will be able to reinvest at a more advantageous rate than the initial investment. After a while, the gain on reinvesting the coupons will offset the capital loss. Conversely, if market rates decline, coupon reinvestment can only be made at a less advantageous rate than bonds already held in the portfolio. However, the market value of these bonds increases, generating a capital gain. Similarly, this gain will compensate for the loss on the reinvestment of coupons after a certain period of time. Where T is the yield to maturity of the bond. The concept of duration was invented by Macaulay, which is why it is also called Macaulay duration. This is a weighted average: it is the average of the lifetimes of the flows of the bond, weighted by their discounted value. It can be likened to the duration of the "financial life" of the bond. The duration is always lower than the residual life of the investment. This is understandable, since there are intermediate flows, which will start repaying the initial investment before maturity. Duration is therefore the duration after which the income generated by the obligation offsets the initial investment. (Still assuming that intermediate flows can be placed on the market at the yield to maturity T). It can be shown that to immunize a portfolio against interest rate risk, its duration must be equal to the expected holding period. This implies investing in instruments whose residual life is actually much longer than the expected holding period, since as we have seen, the duration is always less than the residual life of the instrument. The higher the bond's nominal rate, the higher the coupons amounts, and therefore the interim payments, and hence the lower the duration of the bond. In contrast, a zero-coupon bond has a duration exactly equal to its maturity, since it does not pay coupons. Similarly, the longer the life of the bond, the longer its duration, but the relationship is not proportionate. We have seen that the market price of a bond security reacts in the opposite direction to the changes in interest rates. What are the factors that influence this reaction, and in what proportion? The higher the maturity, the stronger the bond's market price reacts to a change in the yield to maturity. The lower the coupon amount, the stronger the bond's market price reacts to a change in the yield to maturity. Where V0 is the initial market value, and V1 is the final market value (after the rate change). But of course this formula is theoretical and does not allow to calculate the sensitivity, i.e. an indicator that will allow to anticipate the reactions of an instrument (or a portfolio) to interest rate fluctuations. The BPV is also called DV01, for "Dollar Value of 0.1%". The price of a bond reacts to changes in the yield to maturity and it is possible to predict in what proportions, using sensitivity. These fluctuations are not symmetrical, i.e. a rise in rates has a more negative impact on the price than a fall in rates has a positive impact. This is due to the convexity of the curve which represents the variation of the price of a bond as a function of its rate of return. It can be shown that the sensitivity is in fact equal to the first derivative of the price relative to its rate of return. The sensitivity therefore gives the slope of the tangent to the curve for a given rate level. The convexity corresponds, for its part, to the second derivative of this same function. The higher the convexity, the slower the bond will react to rate increases (price decreases), and the faster to rate decreases (price increases). Between two bonds, the investor will therefore prefer the one with the highest convexity to keep in the portfolio. Convexity is related to the nominal rate and the maturity of the instrument in the same way as duration and sensitivity: the higher the coupon, the lower the convexity; and the higher the maturity, the greater the convexity.